NBC’s Today has a longstanding tradition of dressing its hosts in elaborate costumes every Halloween, the better to scare its viewers out of their living rooms and into doing something more productive with their mornings. In the past, the crew at 30 Rock has extended network branding initiatives by disguising themselves as Saturday Night Live characters, appealed to very specific fetishists by donning fairy tale garb, and attempted to gloss over behind-the-scenes drama by forcing Ann Curry to marry Matt Lauer in a royal wedding worthy of the Lannisters. 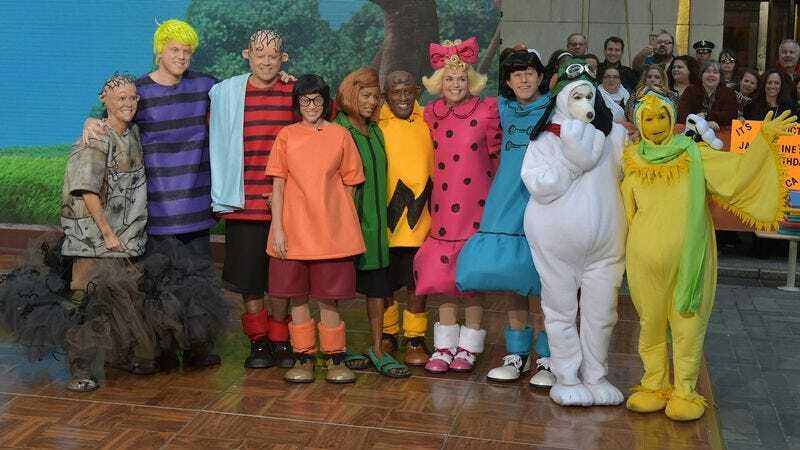 This unending campaign of terror finally reached its peak with the horrific monstrosities unveiled on this morning’s broadcast: Versions of the Peanuts gang that made an unsettling attempt to bring Charlie Brown and friends’ exaggerated cartoon features into the real world. How unsettling? Well, have you ever wondered why Charles Schulz never crafted a three-dimensional, adult-proportioned rendering of Peppermint Patty’s feet? Or why, traditionally, stage productions of You’re A Good Man, Charlie Brown don’t put much effort into recreating the minimalist, pencil-stroke hairstyles of security-blanket-toting Linus Van Pelt or perpetually messy (and apparently melting) Pig Pen? Then again, there’s no questioning the level of verisimilitude that went into Kathie Lee Gifford’s Woodstock outfit. Even novice Peanuts fans know that Schulz took the name of Snoopy’s avian best friend from the famed rock ’n’ roll festival, where hallucinations of an unearthly, wine-fueled, noseless bird/human hybrid haunted any attendee unfortunate enough to ingest the brown acid. For once, skipping Halloween to sit in a pumpkin patch seems like a good idea—provided that blockhead Carson Daly doesn’t show up. Though you’d be forgiven for mistaking that appalling melon of his for The Great Pumpkin.